Between holiday festivities, birthdays and all sorts of baking, this time of the year can get pretty hectic. Throw in last minute dinner guests, and it can all get a bit much for this mama. Want to know how I whip up a delicious meal in minutes? My secret is Lasagna and Caprese Garlic Bread. This meal is so good that your guests will never know that you didn’t spend the whole afternoon slaving over a hot stove. All you have to do with the lasagna is pop it in the oven for 70 minutes. 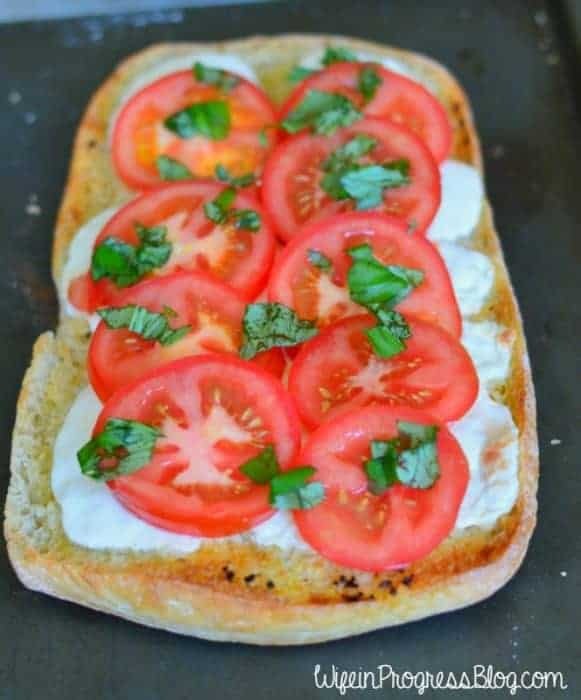 While that’s in you’ll be able to make the Caprese Garlic Bread, shower and get dressed! Now, that’s what I call efficiency. This recipe uses simple, delicious ingredients. 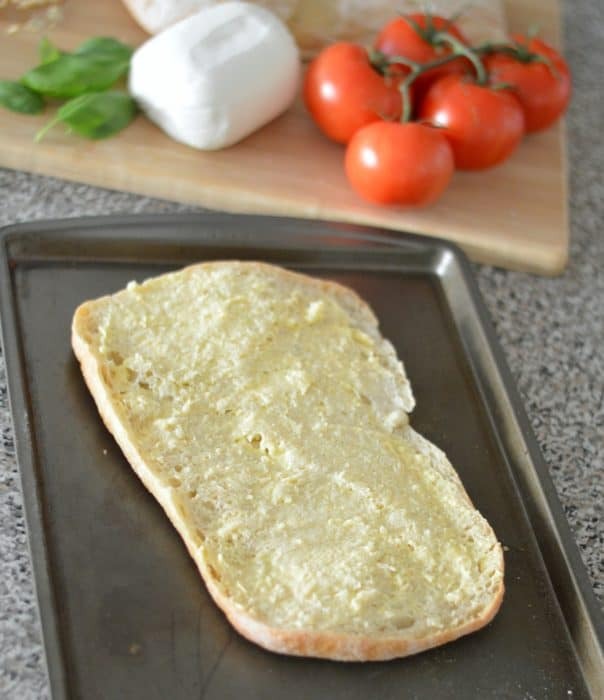 You will never want regular garlic bread again, it’s that yummy. The first thing you’ll want will want to do is make the garlic butter. For a large ciabatta loaf, I find 3/4 of a stick works well. For a smaller loaf, or if you’re just making half the loaf, 1/2 a stick is fine. Pop the butter in a bowl and microwave it for 10 seconds to soften it. Add 2 tablespoons (or as much as you like!) of minced garlic and mash together with a fork. Cut the ciabatta in half, horizontally. Spread the garlic butter over it. 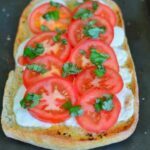 Slice the mozzarella and tomatoes and arrange on the bread. Pop in the oven along with the lasagna and bake for 10-15 minutes or until the cheese has melted. Top with fresh basil, salt and pepper. Alternatively, reserve the tomatoes and basil until AFTER the cheese has melted and place on the bread for a fresher taste. This will be your new go-to garlic bread. 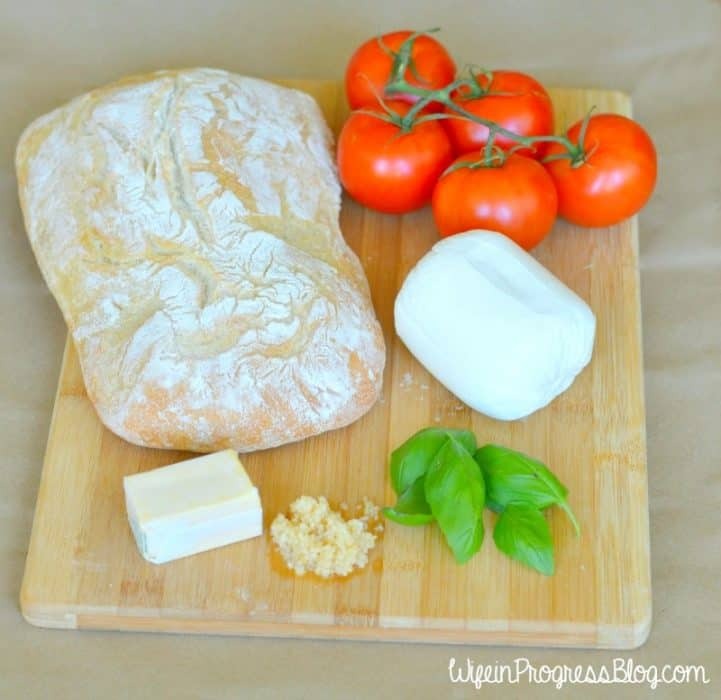 If you love the fresh taste of a Caprese Salad, this will be your new favorite recipe. And paired the cheesy Lasagna … WOW what a great pairing! Make the garlic butter by combining softened butter with the garlic. Add sliced mozzarrella. Place under broiler until cheese has melted. Add tomato slices and shredded basil. Sprinkle salt and pepper over the top to taste. I have an obsession with caprese salad. This sounds amazingly good! Thanks Danielle! It was delicious, definitely a new favorite!